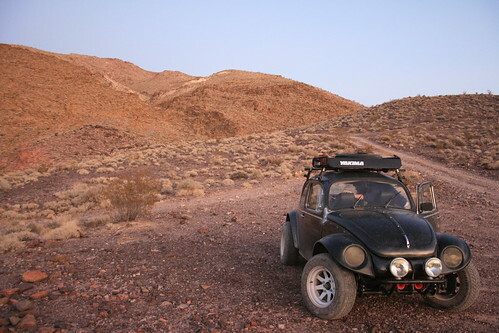 The baja at our camping spot near Inyo's Mine on Lee's Camp Rd. Now that the baja's metal front end work is all done, we decided to take it on a real trip (after the Mendocino test trip). Originally we wanted to take it to Death Valley for it's test trip, but instead, we waited until we had more time (Thanksgiving weekend). Remarkably, we realized that every time we go to Death Valley, we never end up doing as much off-roading as we want to. This is usually because we drive there in the Daewoo. So this time we set a goal to drive on as little pavement as possible! Of course, we needed to get there first, and quickly, so we decided to do the southern route (as opposed to the Tahoe route). As we were driving down I-5, we got into the usual TG traffic. We also noticed the nasty whitish milky smog in the air. It was hard to see the mountains around Bakersfield until you were right in them, literally. As we got closer to Death Valley, the smog started to go away. It took us almost the entire day to get there, so we picked an easy location to camp. We had our site set on a place down Echo Canyon Rd. 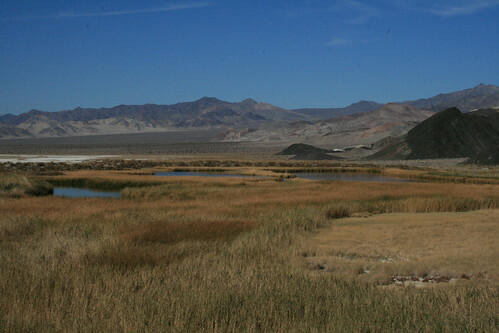 We were down that road only partially when we rented an SUV 3 years ago on our first visit to Death Valley. As we drove down the same road in the baja, it was almost nostalgic, but of course, way more awesome to be in the baja than an SUV! The Hole in the Wall on Echo Canyon Rd. Echo Canyon is a really cool road. At first you drive up a wash. This is really easy going, and a passenger car could do it as long as it didn't bottom out. At the end of the wide wash, there is a small winding entrance to a canyon. There are literally a bunch of S-curves once you enter the canyon, and it starts to get very narrow. Eventually, you get to a place called 'The Hole in the Wall,' which is a cool hole in the canyon wall. If you stand in the right place, you can see all the way into Death Valley Furnace Creek area through the hole! We weren't sure how much farther the road kept going into the canyon, but it sure did keep going. 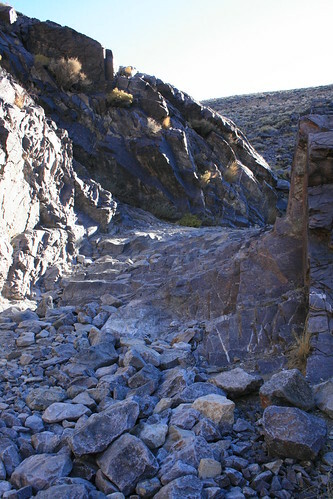 Eventually we saw a sign for Inyo's Mine, which indicated it was at the end of the road. So we kept going, since we still had some daylight left. But once we got there, the road didn't actually end! It kept going over the Funeral Mountains and into Amargosa Valley. We were here to go exploring off-road, so we thought, why not? Lets go over the mountains. . . . The infamous dry falls on Lee's Camp Rd. Well, we literally got 100 feet down the road when we saw an awesome camping spot. Since it was getting dark, we decided to stop. The sun dipped behind the mountains and suddenly it got cold. Really really cold! We built the tent as fast as we could, and then jumped back into the baja (which stays much warmer than a tent, just from body heat). As usual, the wind picked up a little, making it even nicer to be inside the baja. The Funeral Mountains are a bit strange after sunset. They are bare rock, but not like granite. They look almost crumbly and very very dry. They are called the Funeral Mountains, not because of people dying in them or anything, but instead because they have tops which are black in color. The black coloring reminded the first explorers of funeral clothing, so they called those mountains the Funeral Mountains. Who knows if that's true. A lot of things named in Death Valley have to do with death and dying because it was hard to live there (so hot and dry). You could really tell what must have been on those explorers' minds if the first thing they were reminded of when they saw black in the mountains was a funeral! But anyways, as I looked out of the baja window, the setting sun made the mountains glow an intense orangey-red. It looked almost like the rocks themselves that made up the mountains were red hot and luminesceing. At the same time the mountain tops began casting comparatively dark shadows. It was getting spooky! 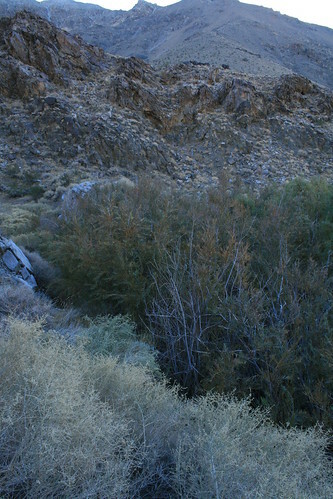 The hidden Willow Spring in Gold Valley. Eventually it got dark, so we turned on the little light so we could read the awesome Back Country Adventures, Southern California guide book to off road mini adventures in a car. We wanted to drive Amargosa Rd the whole way, so we checked the book about what that entailed. The guide book gave it a hard rating, because of one section (like a crux) in the middle called the waterfall. It said the waterfall was passable, but did not recommend doing it if you were alone. Well, we were still eager to go drive down the road a while, even if it meant just to the waterfall and back. And so that's what we did the next morning. We attempted it, but the nature of the waterfall's shape and step-like pass made us afraid we would bottom out and hit the trans or engine really hard. So after having a bit of fun trying to turn the baja around 180 degrees in a slot canyon just barely wide enough for two cars, we headed back towards civilization (Furnace Creek for coffee!!!). There Romy found a guy who was riding the same 80s motorcycle that he had in the basement all apart. You can probably now guess that we stayed at Furnace Creek for a little while longer. One hour later, we headed back into the lonely stretches of the park. The first place we hit was Greenwater Valley Rd. Up back in that valley, we found even more roads that went up into random canyons, and up to cold springs. One spring we found was called Willow Spring. It was so crazy bushy with willows that even the animal trails were being overgrown! Sunset at Ibex Springs, the site of an old talc mine. 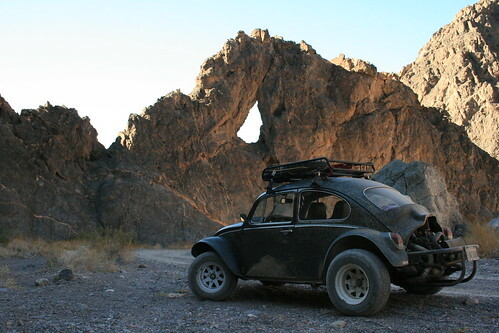 Our ultimate goal was to get to Ibex Springs, which is in the southeastern section and only accessible by off-roading. Ibex Springs was close by to an abandoned talc mine, called Ibex.Somebody planted a lot of palm trees at the spring, and also protected them by building a roof over the source pool. We almost missed the turn off, but eventually made our way towards Ibex. The road had warnings that deep sand was ahead. It sure was! Then when the sand was done scaring the hell out of you, the road started to go up and down and up and down in a very sinusoidal way and got pretty rough and washed out. We were roaring about 45 degrees along an alluvial fan. The sinusoidal ups and downs were the natural separation distances between washes. That's kind of interesting. When we were getting close, we no longer had to look at a map to know where to go. We saw huge palm trees, so kept driving towards them. When we got there, the sun was setting. And it was completely abandoned, meaning we were the only ones there. So we explored the springs for a few minutes before it got dark, and then built our tent, and soon went to sleep. 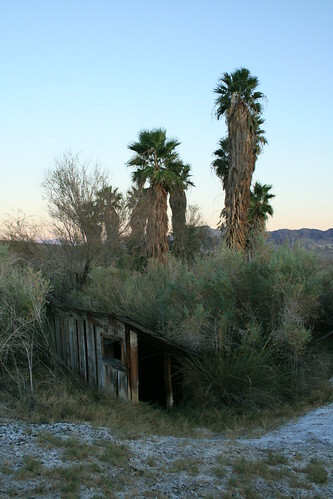 The shed that protects the cold springs at Ibex. When we woke up, the sun was so warm and strong. But getting out of the tent was hard because it was still kind of cold. The next stop in our plan was to see the Ibex Dunes. 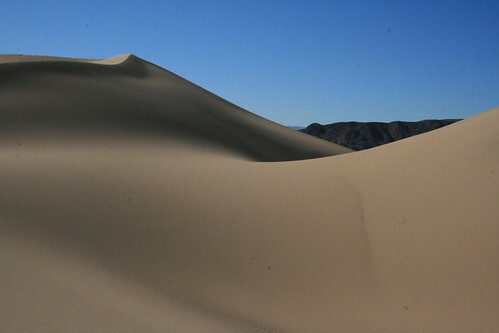 I think those were the last set of dunes that we hadn't yet seen in the park. 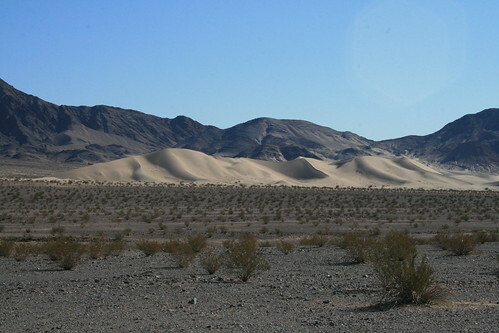 These were about as tucked away as the Eureka Dunes or Saline Valley Dunes. From what it looked like on the map, we should've been able to drive right up to them. So that's what we set out to do. I love dunes, and especially going walking on them. 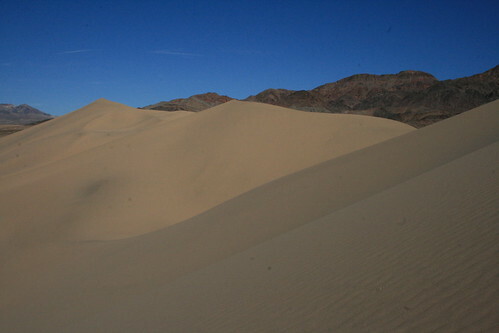 Death Valley has some of the biggest and best dunes. Driving to them would take us about an hour, even though they weren't so far away. When we finally saw them, they looked like they were close. But we just kept driving and driving towards them, with the dunes not really getting any bigger. The scale of things in the desert is so huge but you don't really realize. Well, eventually we did get to them, but then the road started curving away. We were still pretty far (about two miles) away, but it was clear to us now that that was about as close as we would be able to get by the road. So we parked the carr off to the side, and started walking. We took a drive to Ibex Dunes. We saw a lot of other footprints actually in the sandy washes on our way to the foot of the dunes. I guess we weren't the only ones with that idea. As we looked closer, we could see other people further out in the dunes. But they were still really far away, all the way down the dune that they looked like ants, not like people And at last, after about a half hour walk, we made it to the foot of the dunes. We saw only one trail in the sand. The rest of the huge dunes we could see were completely untouched and fresh. We were gonna be the first tracks since the wind erased the others. The dunes were big and steep, and it was a real challenge to get up them very fast. But we made it to the top, where we had an excellent view. The wind patterns made some of the dune formations look really cool. There were peaks, saddles, and bowls. Straight lines, curves, and ripples. We could've spent all day walking around on those dunes, but we had to keep going on to our next destination, which was Saratoga Springs. The springs were actually not that far away (less than a 1/2 hour drive, I think). There was a small parking area at the trailhead to the springs. The trail was only about 1/2 mile long until the springs. The coolest thing about walking to see those springs was the sudden change in scenery. One minute you were driving next to a dry playa, kicking up loose dirt and dust with each step, and the next minute you hear crickets singing, frogs croaking, dragon flies buzzing, duck quacking, and birds chirping. The reeds and grass grew so high, they were way over your head. There was almost no way to navigate through it without getting wet. The trail ended there at the springs, although if you wanted to go further past the springs, you could keep going on what I think must have been an old mining road. The Ibex Dunes are not well trodden. After getting our fill of the springs, we headed back to the car and ate a small lunch. A few more people trickled in and out of the parking lot. I was surprised. When we were done eating, we drove out of there and to our final destination in our plan, which was the Owlhead Mountains. These are in the southern end of the park. I'm not sure why there is a road through them, but I think it has something to do with a communication tower. We started heading down that road, and it was pretty well graded, but also kind of boring. Romy had fun with the baja speeding along. The scenery was cool, but the road had high banks, so you felt weird, like in a channel or something. We stopped after about half an hour when we saw a palm tree. We had hit the Owl Head Springs. It was actually kind of trashed when we got closer. The palm tree was growing out of a weird ditch, there were animal fences all around, and junk or trash remnants strewn all over. What a weird place. Saratoga Springs was a wildlife haven and unexpected. When we got our fill of the palm tree and looking at interesting garbage, we headed back to the baja. There was a branching road that started at the springs and went up and back into the mountains. 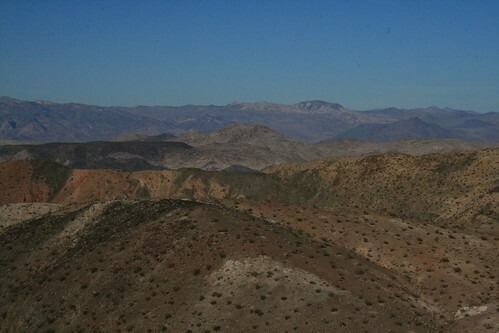 According to the Back Country Adventures guide book, the mine at the end of the road had great views. So we decided to go. It was kind of a rough road, and got very narrow in some parts. It was in general not very interesting, except when three wild burros ran right along side us. Then they got scared, and started running away towards the top of a hill. They stopped all at the same time, and from the top of the hill, just watched us drive past them. We nick named them "The Three Amigos." Soon after the bend in the road where we saw the burros, the road got really narrow, rocky, and dusty. It continued up a steep and washed out incline, which we didn't feel like doing since we were basically at the top. So instead we got out to walk the last few remaining feet to a great view of the surrounding basin and range. It would be a good spot to camp at in the future as it was open and flat with some great views. And I guess that would be the furthest point in our adventure. After that, we drove back down the road, passing our "Three Amigos" who now stared at us driving by again, and kept going until we were almost back at Owl Head Springs. We took a small detour to check out an old abandoned 50s car, but then kept rolling right out of there, and hit the main highway up Death Valley. I think that section (going north on the Henry Wade Rd) was the very best scenery in terms of Death Valley. Entering the Valley from the south was really cool! The view from Black Magic Mine. That night, we drove far past when it got dark, trying to get as far out of the park as we could get. The next day, our goal was to try and get back home by nighttime. 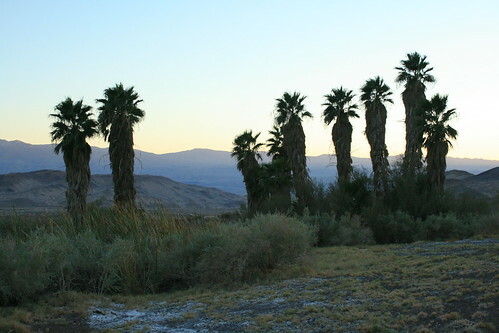 Still, we only made it slightly past Stovepipe Wells to a nice camp site past the airport landing strip. That campsite reminds me that there is a rode that goes up and across the alluvial fan just to the south west. I think it starts with an L. We'll save that for next time I guess! Clued-up post! Your accepted wisdom is great. Thanks for keep me notify. For more information I will be in touch.